Our story starts about one year ago when our beloved family member Keesha, an American Eskimo, passed at the age of 16. A great void was left in our home and we were determined not to make any new additions to the family for awhile. However, as fate has it, on Oct 1st while my wife was out walking our 10 year old Australian Shepherd she was followed home by Annabelle. She called me outside to check her over. She was a bit thin, scared and had no collar. While I was extremely hesitant about bringing her in the house, once our eyes met, it was like there was a bond and I knew she was a good dog. She followed me into the house like she owned it and has not left. We took her to the vet down the street to see if she was chipped. We were told, no chips, under a year old and under weight. We posted in the local lost pets classified and on the Lost Pet Hotline. While waiting for the call I knew would come we fed, exercised and read up all we could on GSD's. We discovered that she had wondered the neighborhood for about 3 days scrounging from people kind enough to giver her a morsel here and there. During our walks she would always end up leading us to the bench at the park where she would set down as if she were waiting for someone to come and pick her up. After 10 days we knew no one would claim her and we also knew that we were in for a very BIG change in our home and our routine. In this time we had noticed that while she was house trained she would urinate on the carpet. It was a very strong odor and we ended up getting rid of the rug. As we were taking her to the vet anyways this would be ONE MORE thing for them to check out. end she had a fever, ear infection and urinary tract infection in which the vet she had had for awhile. Now, one year later, Annabelle has become a solid and loyal member of our family and she no longer takes the detour to the park bench. Additonally she has put on over 20 pounds. She loves kids and always keeps a close eye on our grand kids when they are over. If one starts crying she is there instantly to ensure they are o.k. The few folks that gave her some meager morsels a year ago will always stop us during our walks and say hello to her. When it comes to attention I don't follow the rules of the book. I will not deny her the pat on the head and rub on the stomach when she comes and nudges my hand. She wakes me up in the morning, will see me off to work and is there at the door when I come home. She never complains, don't talk back and has become my companion that always seems to be there to listen and comfort me after a long day. We have decided that October 1st will be her 2 year birthday. So that being said, I want to wish her a Happy Birthday and thank her for coming home to our family! 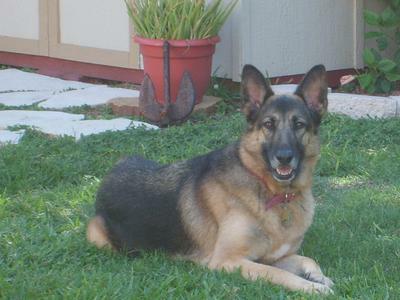 Thanks so much for filling us in on your story and how your German Shepherd Dog Annabelle came into your families life. She is definitely a keeper! So sorry to hear for your prior loss but isn't it funny how fate steps in and makes things work for us. Your wonderful rescue of Annabelle will continue to serve you for years to come. And who knows, that one decision of rescuing a German Shepherd Dog down on it's luck may one day turn into a lifesaving situation for you. At the very least, it will certainly end in giving you years of happiness and who, in their right mind, would turn that down? Thanks so much for taking her in! And continued success to her in the future. Happy Birthday Annabelle! You are loved! What a Great story!!! Annaelle is a Beautiful German Shepherd. She was side track for awhile but hit the jackpot when she saw your wife and your Australian Shepherd walking, she must have sensed "something" there and I think Annabelle pick them first and you completed the packaged. She wanted a family and she got it, good for All of you. German Shepherds are very good dogs, loyal, trustworthy, obedient but most of all, they are Protectors, it doesn't matter if they are female or male, it's in their blood. I believe in fate because fate has come to us twice with my black Lab, Ebony and now with my German Shepherd, Mia. You can read our story just look for German Shepherd puppy Mia story and Mia my Beautiful German Shepherd Dog our story is Great too! Take care of you Girl Annabelle and she will always be there for you. What a good choice for Oct 1st - Happy Birthday Annabelle!